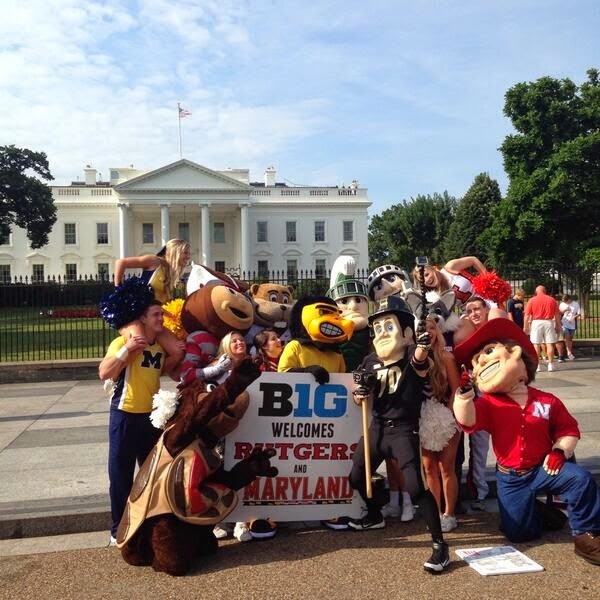 Shirts With Random Triangles: Big Ten mascots gather for photo shoot in front of White House for photo shoot. The B1G mascots were accompanied by cheerleaders from Illinois, Indiana, Michigan, Penn State, and Wisconsin. The Illinois, Indiana, and Michigan, of course, do not have mascots (thankfully). No explanation was given for why Penn State's Nittany Lion or Wisconsin's Bucky Badger mascots were not in the photo. Though I can imagine the Secret Service may have prevented Bucky from being so close to the Oval Office, as he is evil incarnate. You can make your own Penn State jokes. EDIT: Bucky's there, hiding behind Brutus Buckeye's big head.